29 Long Acre East is a neat double-fronted Edwardian Villa built in 1910 for an insurance agent, Henry Thompson, as evidenced by the stone on the west gable wall bearing both date and initials. The land had formed part of an ancient pasture called Parr’s Close, part of which had been used to build East Cottage next door some thirty years earlier. 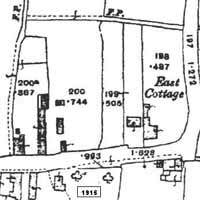 The parcel of land on which Oak Villa stands was sold at the same time as the land for East Cottage but seems not to have been built upon then. It was not, as might first be imagined from the position of the house, sold off from East Cottage. It remained in the Thompson family until 1966. Deduction is the name of the game researching 29 Long Acre East! The house has a builder’s stone in the west gable wall with the date 1910 and initials HT carved on it. Documents for East Cottage next door, reveal the true history of ownership of the land and we have to deduce some of the later history! In April 1810 a William Chettle, farmer and grazier of Thornley, Cambridgeshire inherited a piece of land called Parr’s Close from John Chettle, grazier of Bingham. Chettle’s son, known as William Chettle Senior, a farmer of Bingham, had inherited the close at some point and possibly around 2nd January 1837 (the first deed document available for East Cottage) sold part of the close to William Sills. The first document in the deed bundle for number 29 is dated 28 April 1921, by which time the house had existed for over ten years. That document records the sale for £90 of a piece of freehold of land in Bingham. A bricklayer named Arthur Victor Clipstone, formerly of Bingham but then of Rotherham, sold the land to Henry Thompson, Insurance Agent – so here we have our HT for whom Clipstone probably built the house. One’s first impression is that the house stands on land split off from East Cottage after the latter was built. When you look at the actual properties it seems a reasonable assumption, but it is not what happened! Clipstone may have bought the whole plot from Swanwick intending to build two houses. In the event he built only one house on half the plot and sold the land and the house we assume he built to Thompson. He presumably retained the other half of the plot, which he sold to Thompson in 1921 restoring the Oak Villa plot back to its former size. The documents for this initial purchase are missing. and the same piece of land now being described was formerly in the occupation of said W H Swanwick and now in that of Henry Clarke. The succession of OS maps shows how Swanwick’s plot was divided. 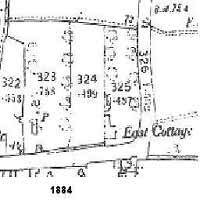 1883 shows East Cottage as parcel number 325 and measuring .487 acres. Parcel 324 next door is .499 acres, virtually the same size as East Cottage. Parcel 324 is next door to Donkey Green Cottage, confirming the original land description. By 1915 parcel 324 (now 199) has been split into two, measuring in total .505 acres. The eastern portion shows Oak Villa, the western portion has no development. The third entity is the piece purchased in 1921 (the other half of the original plot) and indeed more recently was sold off to build number 27 Long Acre! C H Thompson sold the property to Anthony Shipman of 29 Carnarvon place in 1966 for £2600. In 1941 he sold a 240 square yard plot in the North east corner to Mr Hinde, a neighbour to extend his garden. In 1978 Shipman sold to the present owners.